A method for the determination of 38 polycyclic aromatic hydrocarbons (PAHs) and semivolatile organic compounds in solid samples is described. Samples are extracted using a pressurized solvent extraction system. The compounds of interest are extracted from the solid sample twice at 13,800 kilopascals; first at 120 degrees Celsius using a water/isopropyl alcohol mixture (50:50, volume-to-volume ratio), and then the sample is extracted at 200 degrees Celsius using a water/isopropyl alcohol mixture (80:20, volume-to-volume ratio). The compounds are isolated using disposable solid-phase extraction (SPE) cartridges containing divinylbenzene-vinylpyrrolidone copolymer resin. The cartridges are dried with nitrogen gas, and then sorbed compounds are eluted from the SPE material using a dichloromethane/diethyl ether mixture (80:20, volume-to-volume ratio) and passed through a sodium sulfate/Florisil SPE cartridge to remove residual water and to further clean up the extract. The concentrated extract is solvent exchanged into ethyl acetate and the solvent volume reduced to 0.5 milliliter. Internal standard compounds are added prior to analysis by capillary-column gas chromatography/mass spectrometry. Comparisons of PAH data for 28 sediment samples extracted by Soxhlet and the accelerated solvent extraction (ASE) method described in this report produced similar results. Extraction of PAH compounds from standard reference material using this method also compared favorably with Soxhlet extraction. The recoveries of PAHs less than molecular weight 202 (pyrene or fluoranthene) are higher by up to 20 percent using this ASE method, whereas the recoveries of PAHs greater than or equal to molecular weight 202 are equivalent. This ASE method of sample extraction of solids has advantages over conventional Soxhlet extraction by increasing automation of the extraction process, reducing extraction time, and using less solvent. Extract cleanup also is greatly simplified because SPE replaces commonly used gel permeation chromatography. The performance of the method (as expressed by mean recoveries and mean precision) was determined using Ottawa sand, a commercially available topsoil, and an environmental stream sediment, fortified at 1.5 and 15 micrograms per compound. 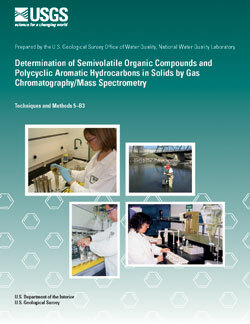 Recoveries of PAH and semivolatile compounds in Ottawa sand samples fortified at 1.5 micrograms averaged 88 percent ± 9.4 percent relative standard deviation, and calculated initial method detection limits per compound averaged 14 micrograms per kilogram, assuming a 25-gram sample size. The recovery for 1,2,4-trichlorobenzene is less than 60 percent; thus, the concentration of this compound will always be reported as estimated with the “E” remark code. The analysis of 25 alkylated PAH homolog groups also can be determined with this method with extra data analysis and review, but because of the lack of authentic reference standard compounds, these results are considered to be semiquantitative. The PAH homolog groups are quantitated using the response factor of a parent PAH method compound, if available. Precision data for the alkylated PAH homologs detected in a marine sediment standard reference material (SRM 1944) also are presented to document and demonstrate method capability. 1. Solid-phase extraction assembly for accelerated solvent extracts for use in determining semivolatile organic compounds and polycyclic aromatic hydrocarbons. 2. Solid-phase elution module assembly used in the analytical method for determining semivolatile organic compounds and polycyclic aromatic hydrocarbons. 3. Graph showing least squares regression plots for concentrations of naphthalene (A) and benzo[a]pyrene (B) determined in 28 sediment samples by accelerated solvent extraction (ASE) and by Soxhlet extraction. 4. Boxplot showing results for analysis of 28 environmental soil and sediment samples. 1. Semivolatile and polycyclic aromatic hydrocarbon compounds determined using this method. 2. Alkylated polycyclic aromatic hydrocarbon homolog groups determined using this method and reported with estimated concentrations. 3. An example of an accelerated solvent extraction (ASE) schedule for 13 cells. 4. An example of an accelerated solvent extraction (ASE) method for a 120°C extraction. 5. Retention times, relative retention times, gas chromatography/mass spectrometry quantitation ions, confirmation ions, and percent relative abundance of confirmation ions for individual method compounds and alkylated polycyclic aromatic hydrocarbon homolog groups. 6. Gas chromatography/mass spectrometry analytical sequence suggested for use with this method. 7. Compounds with relative response factors used for the quantitation of alkylated polycyclic aromatic hydrocarbon homolog groups. 8. Semivolatile and polycyclic aromatic hydrocarbon compounds detected in unfortified reagent-sand, stream-sediment, and topsoil samples. 9. Polycyclic aromatic hydocarbon and semivolatile compound mean bias and precision of spike recovery data for nine replicates with compounds spiked at 15 micrograms per sample in reagent-sand, stream-sediment, and topsoil samples. 10. Polycyclic aromatic hydrocarbons and semivolatile compound mean bias and precision of spike recovery data for nine replicates with compounds spiked at 1.5 micrograms per sample in reagent-sand, stream-sediment, and topsoil samples. 11. Mean bias and precision of spike recovery data for nine replicates with compounds spiked at 1.5 and 15 micrograms per sample in reagent-sand, stream-sediment, and topsoil samples for compounds that are not included in this method. 12. Initial method detection limits calculated from the precision data reported in table 10 for the nine replicate reagent-sand samples spiked at 60 micrograms per kilogram per compound. 13. Concentrations certified by the National Institute of Standards and Technology for Standard Reference Material 1944 determined by Soxhlet extraction and this method. 14. Concentrations of alkylated homolog groups detected in Standard Reference Material 1944 determined by Soxhlet extraction and this method, but not reported by the National Institute of Standards and Technology. 15. Replicate environmental sample results, in micrograms per kilogram, using accelerated solvent extraction. 16. Mean average deviation and range of average deviations for compounds detected in nine duplicate sediment samples and one triplicate sample extracted using accelerated solvent extraction. 17. Soxhlet and accelerated solvent extraction concentrations, in micrograms per kilogram, for 28 sediment samples. 18. Correlation of Soxhlet and accelerated solvent extraction results for 28 sediment samples. http://nwql.cr.usgs.gov Document Accessibility: Adobe Systems Incorporated has information about PDFs and the visually impaired. This information provides tools to help make PDF files accessible. These tools convert Adobe PDF documents into HTML or ASCII text, which then can be read by a number of common screen-reading programs that synthesize text as audible speech. In addition, an accessible version of Acrobat Reader 7.0 for Windows (English only), which contains support for screen readers, is available. These tools and the accessible reader may be obtained free from Adobe at Adobe Access.